Last week the most remarkably normal thing happened. 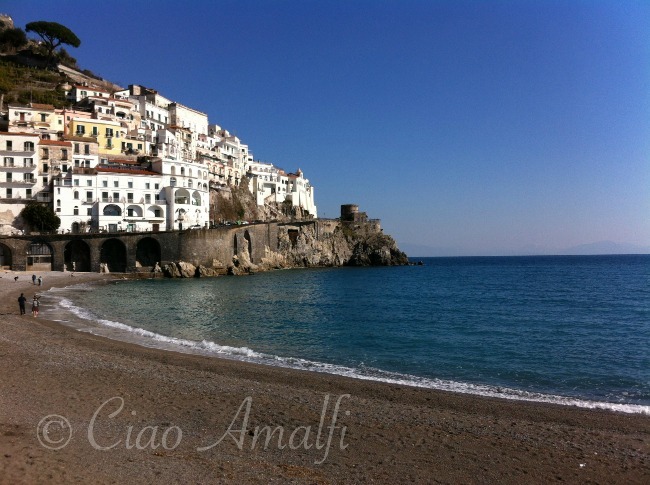 I went for a walk in Amalfi with my husband. Normal because we’ve done that together countless times over the past eight years. Remarkable because it was the first time we’ve done that since last autumn when he got sick. While his recovery process is coming along — albeit slowly — it was a huge boost in spirits to be able to do such a normal thing again. 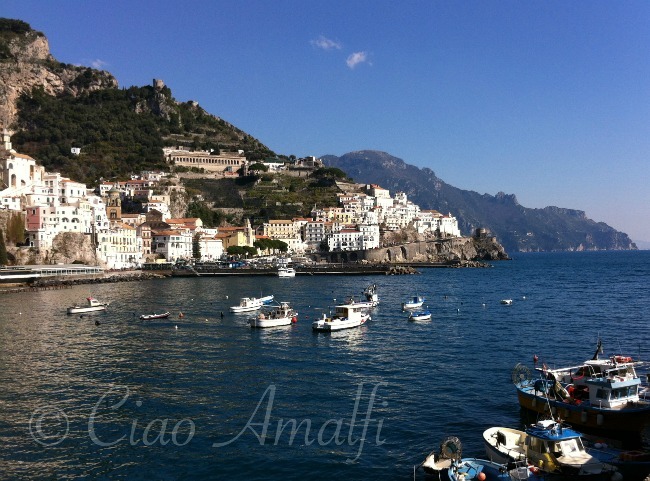 And, of course, Amalfi was stunning. When the sun shines in February something magical happens. I’ve not yet figured out if it’s just the contrast to rain and clouds or if the blues are somehow more blue. Something is different though. As we walked along the harbor I couldn’t get over just how blue it was. 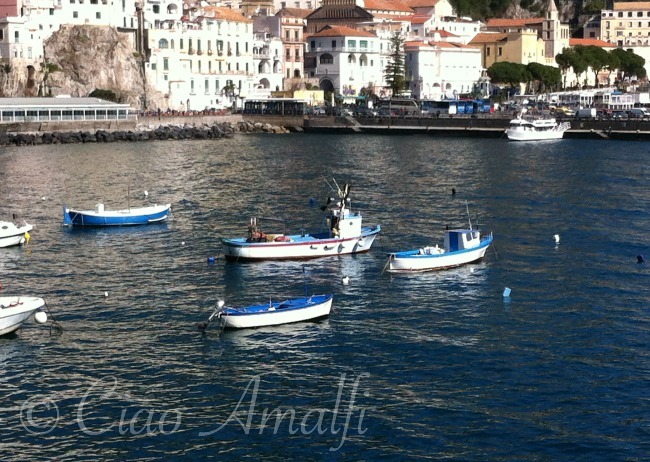 Everything was blue – the sky, the sea, the railings around the Amalfi cross, the boats. It was as if all I could see was blue. 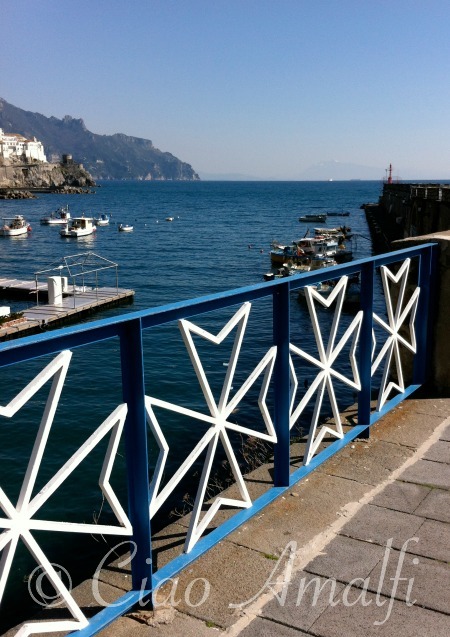 My favorite walk in Amalfi is along the raised level of the pier that defines the harbor of Amalfi. We had it all to ourselves on this gloriously sunny day last week. It was right about here that the old song “My Blue Heaven” popped into my head. Okay, so there was a little bit of red, too. 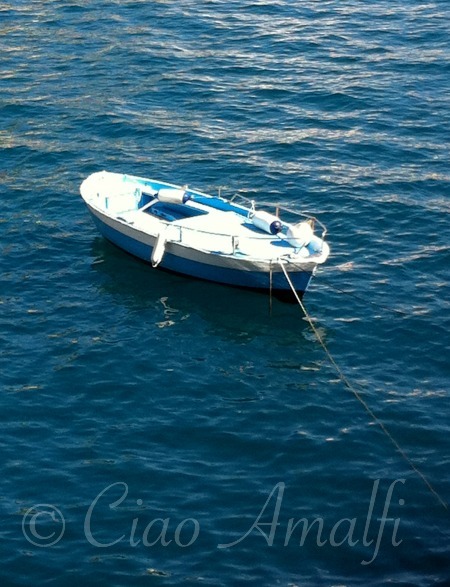 Since our walk in Amalfi was a bit unexpected, I went out without my camera. So to give you an idea just how beautiful of a day it was, these photos were just snapped quickly on an iPhone4. I wished I had brought my camera along with me! Days like this are a beautiful reminder that spring is coming. Yet the light and colors will be different. Still beautiful, but different. There will be many more walks in the sunshine to come! 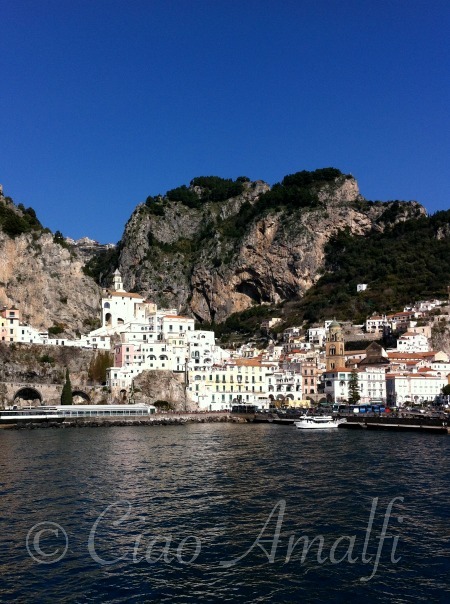 Very few readers of Ciao Amalfi will know that the first spot I visited in Italy was Venice. After dreaming of traveling to Italy for years, my first big trip to Europe and to Italy took me to Venice – and only Venice. With just a side visit to the Ferrari Museum in Maranello. (What did you expect … a day trip to Verona?) I’ve always been one to want to really focus on one place rather than hop, skip and jumping around. It was a marvelous week spent wandering, getting obliviously lost, discovering the quietest piazzas I’ve ever seen and experiencing the first taste of what I would come much later to know – Italy was deep within me. Because of that first visit and all that it meant, I’ve always had a soft spot for Venice. So when I first saw the cover of Dream of Venice my heart gave a little flutter. 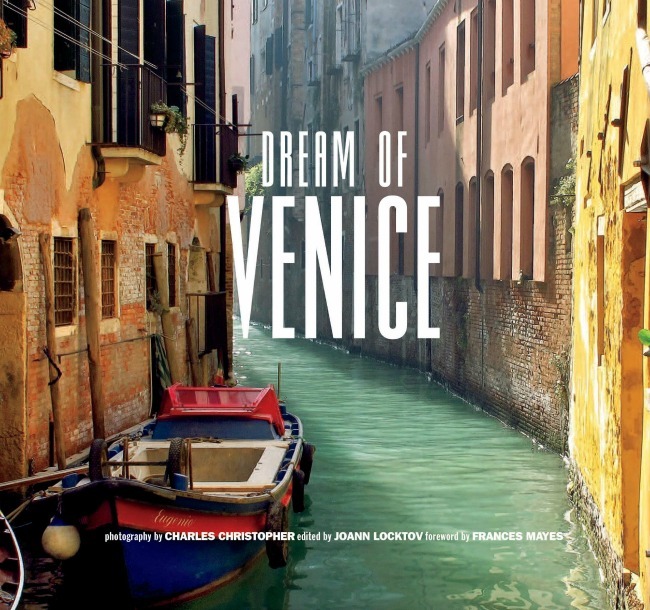 A mini coffee table style book, Dream of Venice is a compilation of writings dedicated to Venice that have been compiled and edited by JoAnn Locktov and beautifully accompanied by photographs by Charles Christopher. 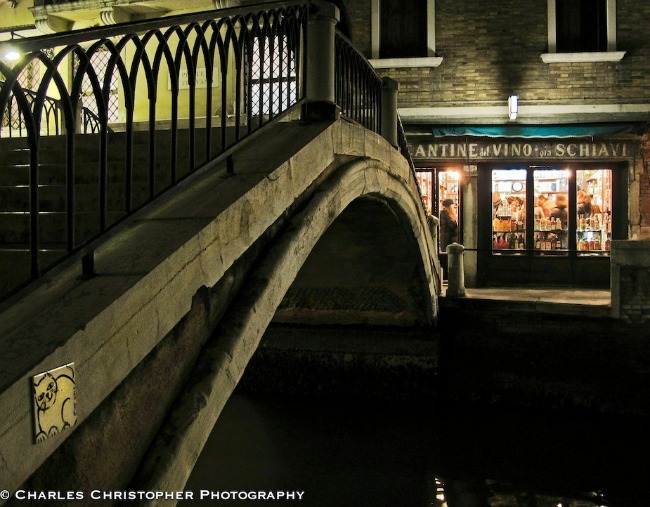 Each writing selection is paired with a photograph of the city, and both words and imagery form a story that twists and weaves through the winding canals, nighttime mystery and enchantment that is Venice. Dream of Venice opens with a foreword by Frances Mayes, which sets the scene. She writes, “Venice is a state of mind. That is, the scintillating, kaleidoscopic, shifting colors of that watery realm remain alive inside me long after I depart the actual city.” That took me right back to 2001 when I stood on the Ponte dell’Accademia clinging to the wooden railing taking everything in while not quite believing I was actually there. By the time I left it was alive inside me just as Mayes described, and reading the passages in Dream of Venice and getting lost in Charles Christopher’s photos was an immense delight. Anyone who has been to Venice will treasure this book and anyone dreaming of traveling there will adore it! One of the parts I enjoyed the most about Dream of Venice was the blend of different voices and and writing styles united by a love of Venice. 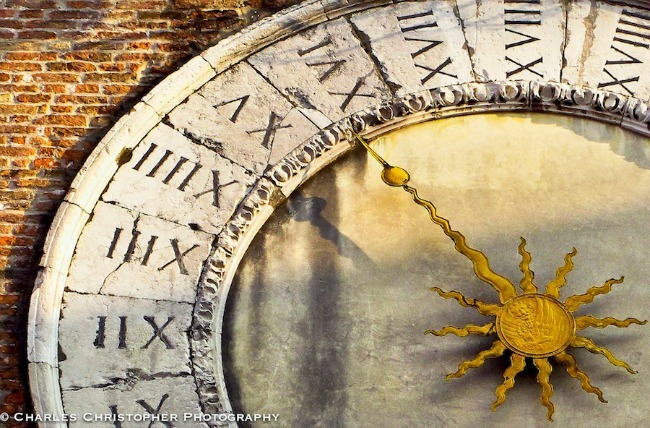 Rachel Dacus enchants with a poem entitled “Wearing Venice” and the mystery of Venice’s darker sides come alive in the writings of Julie Christie, Linus Roache and Marcella Hazan. The captivating descriptions of winter in Venice have made me want to return to experience that side of La Serenissima. When you need a little jolt of Venice, this book is just right. The length of the entries paired with each photo is just right for picking up and enjoying a few with a cup of tea. Well, that’s my style, but there are also some good espresso or cappuccino sized entries, too. 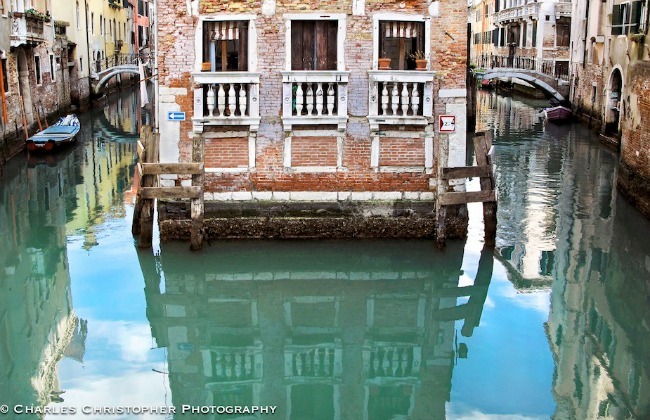 You’ll be dreaming of Venice in no time at all! Find out more about Dream of Venice or buy Dream of Venice on Amazon. I wish I could say that I woke up to this stunning sunrise yesterday morning, because that would have meant I had slept on the flight from Atlanta to Rome. Nevertheless, it was a beautiful sight watching the first signs of morning and enjoying this striking pink surprise somewhere over France. I’ve been in America the past couple of weeks visiting family and helping my mom move. This also meant sorting through all of my remaining belongings in America and condensing what I wanted to keep down to what would fit in two rather large suitcases. Including a lifetime of photos. Even though it was a busy and short trip, it’s always great to see my family! Flying into the Naples Capodichino airport is stunning on a clear day. 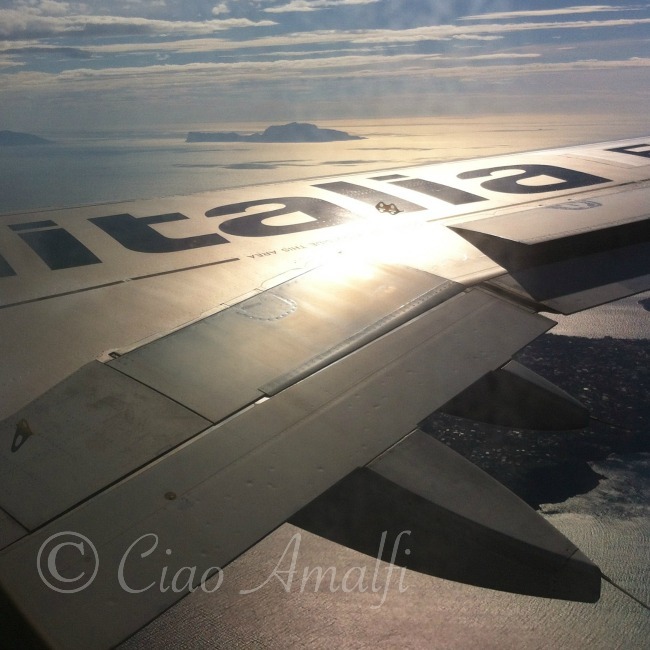 Most of the time the landing flight path from the north comes in over Ischia and Procida, which you can see below the wing in the photo above. 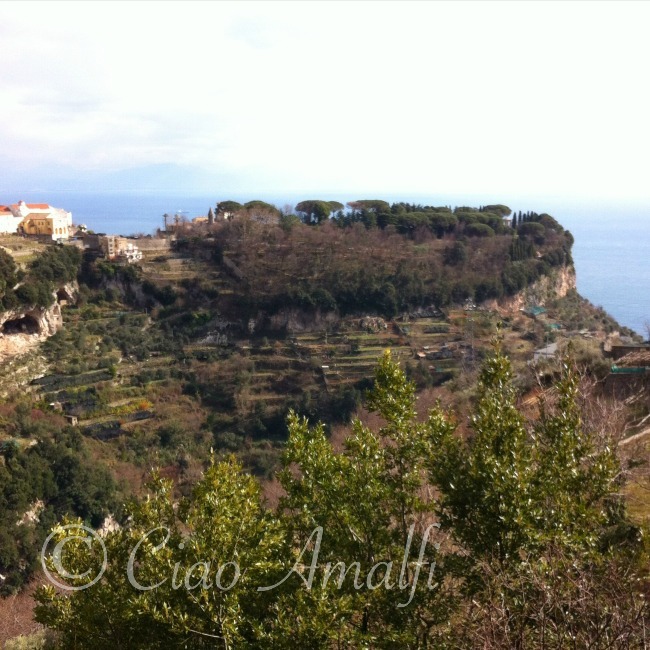 You can also see the familiar outline of Capri with the little peak of Monte Solaro in the distance. Then the plane curves in over the top of Naples with a clear view down right over Vomero and Castel Sant’Elmo and the Certosa di San Martino. If you know Naples you can spot Santa Chiara, Piazza Plebiscito and even the soaring glass dome of the Galleria Umberto I. Oh, and of course Vesuvius! 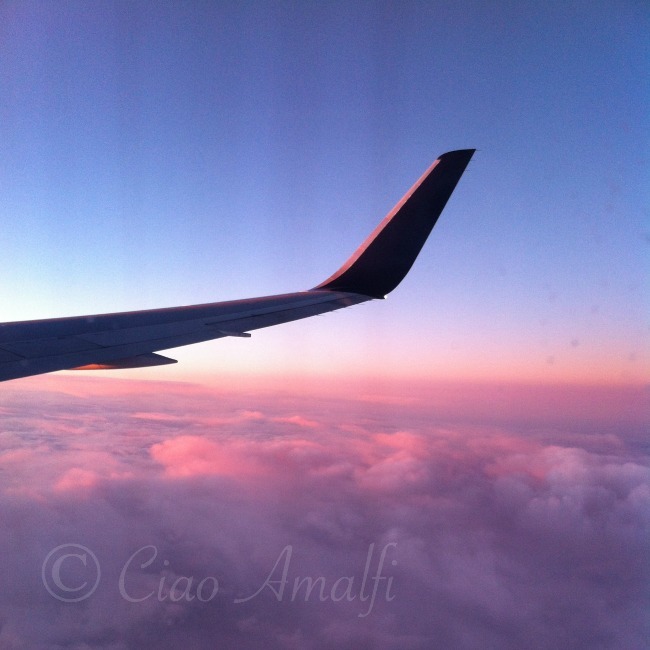 But that’s the view I was waiting to see again – home! 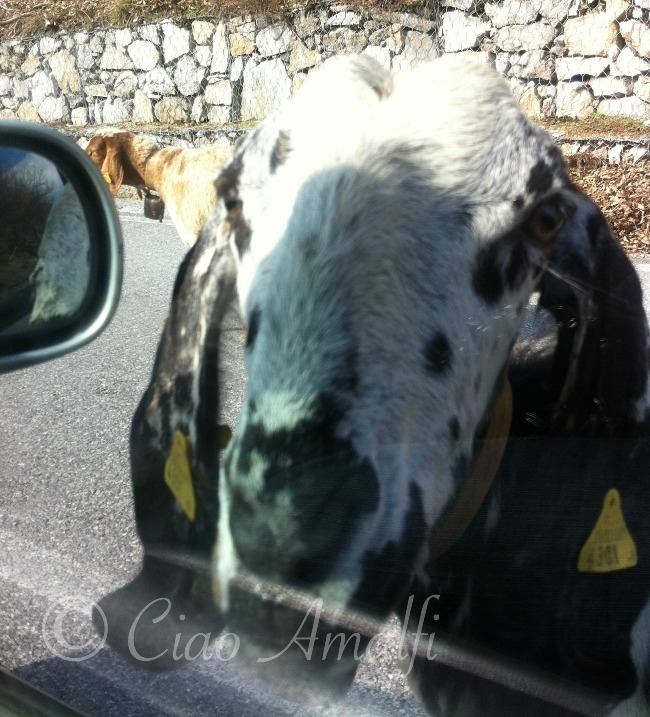 On the way back from the Naples airport to the Amalfi Coast, we ran into a jingly belled traffic jam. 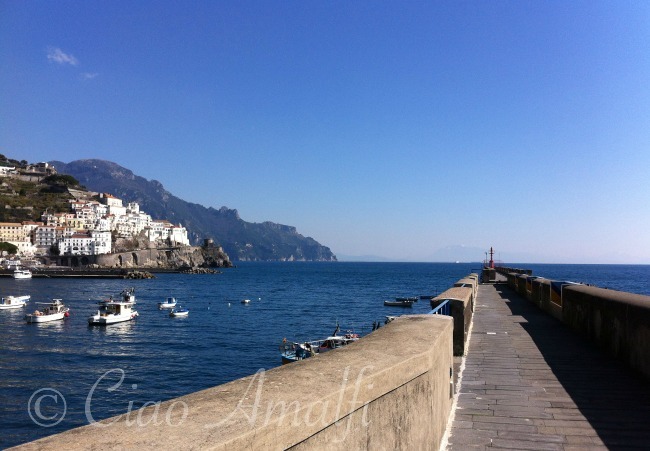 I love showing photos like this one below to people who think the Amalfi Coast is just glamorous hotels, lounging by the beach on a sun bed and endless shops and gelato. (Although the gelato is certainly tasty!) 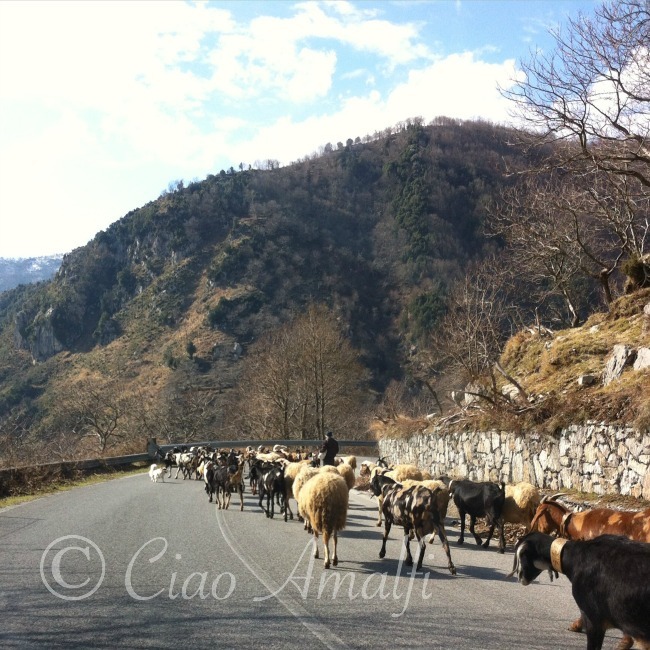 There’s a very rural and rugged side of the Amalfi Coast, and you don’t have to go very far up in the mountains to find scenes like this very typical. But there wasn’t much time for traffic, because we had a very important date. 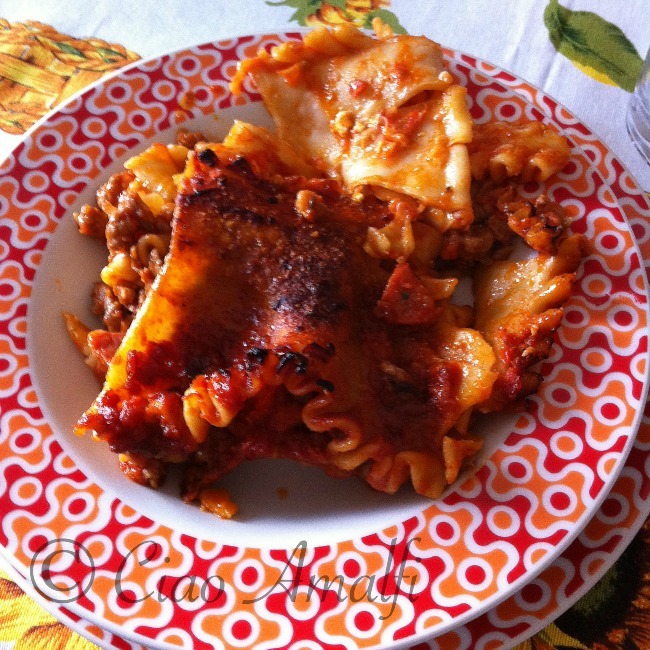 I arrived just in time yesterday on Carnevale to celebrate my favorite part of the day – eating lasagna! I thought that lasagna was traditional all over Italy for Carnevale, but I learned last year that it’s pretty much just the Naples area. For all the rest of you Italy expats, I’m so very, very sorry that you miss Neapolitan lasagna. It is a thing of wonder, especially when made by my husband’s sisters! So it’s not the most photogenic food in the world, but it is one of the tastiest! I also discovered that it really is perfect after 24 hours of traveling and icky airplane food. It’s good to be home again for so many reason! PS: I’m sorry about the iPhone quality photos, but I wasn’t traveling with my Nikon D3200. 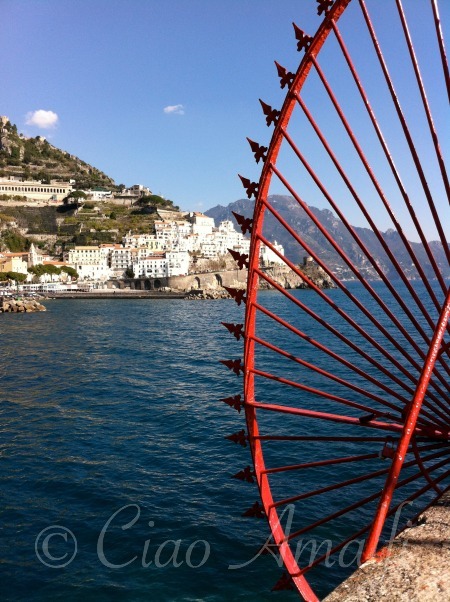 You can find more of my iPhone photos on Instagram at @ciaoamalfi.